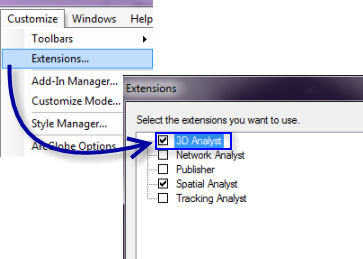 You must enable the ArcGIS 3D Analyst extension before you can work with it. Once you enable the extension for all applications you plan to use (ArcMap, ArcCatalog, ArcGlobe, or ArcScene), you are ready to add toolbars to the user interface to gain access to the 3D Analyst tools. Below is an image depicting the Extensions dialog box from ArcMap. Not all the extensions listed will be the same for other applications. The 3D Analyst toolbar allows you to do all the surface creation and analysis tasks in ArcMap and ArcScene. The 3D Analyst toolbar contains interactive tools you can use on 3D surfaces to interpolate heights for digitized points, lines, and polygons or to create a contour line, a line indicating steepest path, a line of sight, or a profile graph for line results. Use these tools to gain an understanding of patterns in 3D surfaces that are not readily apparent. The tools on the 3D Analyst toolbar differ slightly between whether you want to work in ArcMap or ArcScene. Their differences are described below. 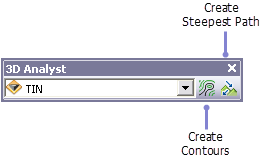 The Options drop-down menu on the 3D Analyst toolbar provides display and interpolation options for profiles. For more information on these options, see: 3D Analyst drop-down menu options. Certain restrictions exist when working with the interactive tools on the 3D Analyst toolbar and terrain datasets in ArcMap. By default, the interactive tools are not enabled unless the terrain is at full resolution. For more information about using the interactive tools with terrain datasets, see: Interactive tools for terrain datasets.